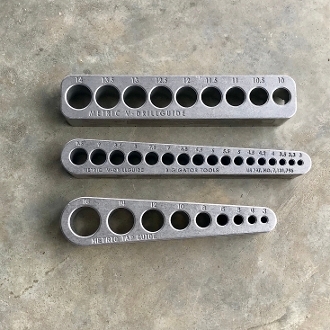 The drill guides are like having a drill press for precision alignment, while the tap guides start every hole straight and helps prevent tap breakage! All the guides have a "v-groove" on the bottom to allow you to work on corners or round surfaces. Each guide is heat treated for durability, allowing a tight tolerance. The guides work great on corners, round and flat surfaces. 100% American made quality and a Lifetime Warranty on every guide!